After Braga's last few seasons, this clash is already considered a clash of titans, and rightly so. Braga's insistence on fighting FC Porto and Benfica for the top spots means that the Estádio Axa is no longer a safe haven for any opponent. Benfica's win against Olhanense on Saturday was on the minds of both teams and neither one could afford to slip up, especially José Peseiro's team, who were also trailing their rivals by six points. FC Porto coach Vítor Pereira made a few changes, bringing Alex Sandro and Fernando back into the team, instead of Abdoulaye and Defour. Other than that, his selection was as expected, particularly in light of both players' appearances midweek against Dynamo Zagreb. José Peseiro's only change from their heavy defeat at the hands of Cluj was the choice of Mossoró ahead of Ruben Amorim. The first half was extremely entertaining and offered further evidence on the merits and qualities of both teams. Whether they were being purposefully more cautious than usual or their latest results were in the back of the players' heads, Braga went down a very different path. In fact, they were hardly similar to anything they have shown over the past few months under José Peseiro. Instead of pressuring, they stood off; instead of attacking in numbers, they tried a more direct style. Apparently, this Braga may well have been Domingos or Leonardo Jardim's. FC Porto came on strong out of the gate and created several clear-cut chances in the opening minutes, Otamendi even hitting the woodwork on the third minute. The Dragons' blueprint did not deviate much from their standard procedures and involved James Rodríguez drifting inward, with Lucho (or Danilo) occupying the Colombian's space. With Mossoró (usually less adept at defending) deployed on the left and Ruben Micael too close to Éder, FC Porto dictated the tempo for the opening 20 minutes, giving the impression the goal would be a mere formality. However, Braga managed to settle down, started showing what they are capable of, and made their first shot 20 minutes into the match - FC Porto would in fact not muster a single shot after Braga's first one until the half-time whistle. Micael dropped further back goalside of Fernando and hindered the away team's passing rhythm. José Peseiro, in turn, read his opponent well. 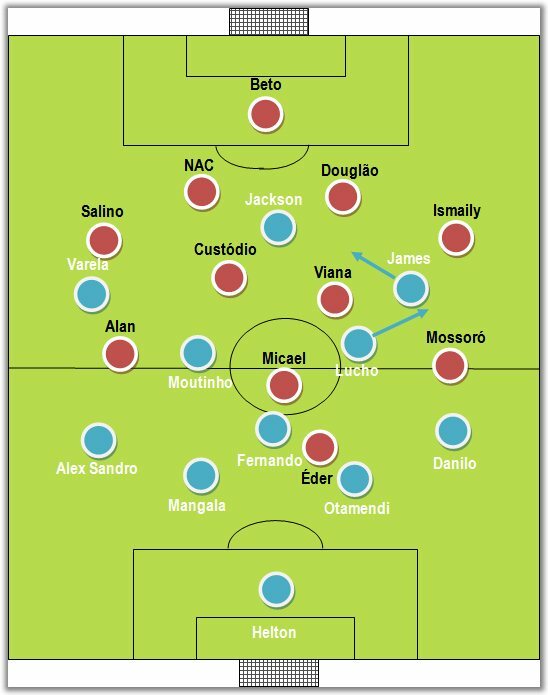 Mossoró's deployment on the left was not an accident, nor was Éder's insistence on drifting to the left wing. James' forays in the middle mean that Danilo (or the centre-backs, whenever Danilo doesn't make it back on time) is often exposed. With Mossoró on the left wing, the team had a clear out-ball and looked to take advantage of FC Porto's known weak spot. The final 25 minutes of the first half would belong to Braga. The second half was far less entertaining, with both teams misplacing numerous passes and apparently too wary of each other. Thanks to Peseiro's tweaks, FC Porto were now unable to find their precise passing to carve Braga's defence open. On the other hand, Braga looked dangerous on the break a few times, but the fear of a loss seemed to mean that the draw was something both teams could live with. To prove just that, José Peseiro did not make any bold changes, opting to rotate his central-midfielders - Amorim for Viana and Djamal for Micael -, since he knew that, despite playing with width, FC Porto are deadly through the centre and he wanted to stop them in their tracks. Ironically enough, that was the area from which the Portuguese champions would grab their late goal. Danilo drifted inward, James got the ball and was quite fortunate with his shot, which hit Douglão (who was at hist best today) and deceived Beto. The goal came only a few seconds before the 90th minute. The fate would be even more cruel to Braga, who would concede their second on the 93rd minute, after an unfortunate clearance from Salino and Jackson Martínez's well placed shot. In conclusion, FC Porto may count themselves lucky, since a draw looked like it was all they were going to get out of the match. Analysing the flow of play from both teams and the opportunities they created, a draw would indeed be a more truthful result. 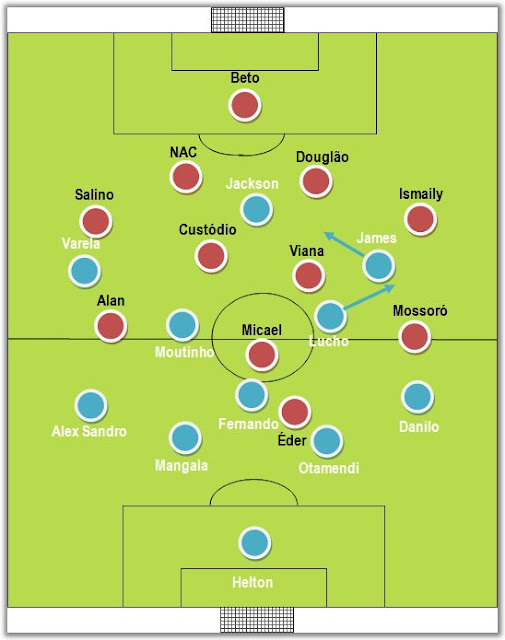 Both Braga and FC Porto tried to win the match on their own, very specific terms and had the chances for it - on periods they clearly dominated. The hosts might have said goodbye to any title hopes, but José Peseiro might have realised that a gung-ho approach is not necessarily the only way to hurt other teams.